*This is a cheap and easily available handgun. This is the subcompact sister to the origional Colt Krait found in the DC books. It is on a lightweight alloy frame, and is a mere 156mm overall. It can accept accept the standard Krait mags, but the bulk is increaced to 1. Dont leave the Controlled Zone without one. *Available in black matte or stainless steel. *A factory installed recoil compensater is also available for an additional $1,250. One concern of today's soldiers is the inability of current ( 9 mm ) sidearms to penetrate the soft body armor that is standard to all combat troops. To do this requires a new system of both gun and ammunition. The Belgian Fabrique Nationale P90 and Five-seveN are the leading weapon system to meet this need. The special, high-veocity, dual core bullets (5.7x28mm), known as the SS190 are backbone of FN's new weapon system. Ammo: .380 Wt: .8 KG Mag: 6 box Price: $99 !! *This very cheap and extremely easily available handgun, is found at almost 50% of all Homicides. Kimber model 1911 pistols are the most tightly quality controlled hand guns, ever. This hand built beauty comes complete with a match grade trigger, hammer, and barrel. Tritium night sights are standard. *This gun comes factory equipped with a laser sight. 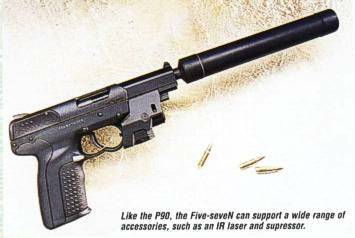 * The P99 comes with an extended magazine for law enforcement officers.